Dammit, this thing is definitely growing on me. I kinda love how there's no narrator. Just engine and exhaust sounds. It's a beast. Parts of the video are scattered around already, but, this is the long version. I figure that $100K might get you into a GT500 for the first year, as GT350R's were going for $100K. Not sure what the based "stripper" MSRP will be, but, after all the dealers add in at least $25K over MSRP, and the taxes and tags are added in, $100K out the door, would not surprise me. Still, I suppose that Ford will sell some, although it is hard to see how anyone could use its performance on the street and stay out of jail, as even my floaty under powered, base GT, has already basically already eaten it stock rear tires, and also a clutch in a mere 6000 miles, and, I am unable to use its moderate, by today's standards, performance on the street, as, slow as it is, it still can do 110+ in a standing 1/4 on street tires, so it gathers speed fairly quickly on a roll and, I have heard, 100+ comes up very soon. 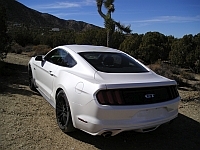 I have also heard that the seats of the GT500 are a tight fit for "normal" folks, so, it is off my list with that excuse, without even taking into account that it is also an auto trans, or that it will cost as much as a nice house in most US housing markets. Ford dealers are still asking $10K over for a the mere Bullitt option, and $25K over for the GT350's, which have the flat plane high RPM mill, and a manual trans, although a paltry 527 HP. In fact, there really are no current Mustangs that can rival the $34750 MSRP, of the fully loaded 2003, Terminator. Even adjusted for inflation, that car was a bargain, and dealers were only holding out for MSRP, not tacking on huge markups. In fact, as time passes, I continue to appreciate more and more exactly what a wonderful car that Terminator was. In fact, the Terminator was a spoiler, as subsequent Mustangs have failed to match up to it. But, in my old age, I realize that I have become that old guy who is always mumbling about how expensive everything has become and who is unable to adapt to technological changes. It is now I who has to ask for assistance with card readers on gas pumps, and it is I who holds up lines trying to use my credit card in some reader, and, it is even I who drives so slowly that "they" all get frustrated and irritated due to being held up while rushing madly around. But, as with those old folks who frustrated me, back in the day, I find that I really don't car anymore about what they want, or what their opinion is, as I am content to take it easy, and that is all that really matters. The struggle is real to ignore this car..LOL! Just replace all the Ford stuff on the car with this.